Positron emission tomography has not traditionally played a major role in the evaluation of hepatocellular carcinoma (HCC). Owing to high background liver uptake and molecular mechanisms within HCC lesions, uptake of 18F-fluorodeoxyglucose (FDG) is variable and prior studies have shown only modest overall detection of intrahepatic disease. Tracers such as 18F- and 11C-choline as well as 11C-acetate have been explored either in isolation or together with 18F-FDG have shown greater promise in detection of intrahepatic lesions, but yet are not in widespread clinical use. 68 Ga-Prostate specific membrane antigen is a tracer developed for use in prostate cancer but a pilot study and several case reports have indicated that there may be the potential for use in the evaluation of HCC. Increased rates of lesion detection using 18F-FDG may be seen in poorly differentiated tumors and in the setting of metastatic disease or within recurrent tumor following loco-regional therapies and FDG uptake may indicate a greater risk of recurrence following transplantation. Further work will be required to elucidate the precise role of other non FDG tracers in the evaluation of patients at risk for or with HCC. 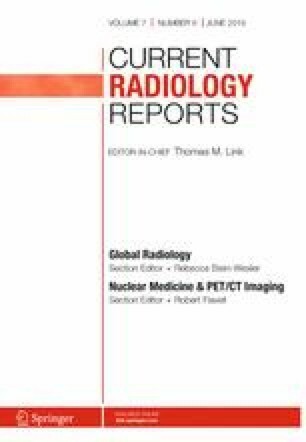 This article is part of the Topical collection on Nuclear Medicine & PET/CT Imaging. Global Cancer Observatory. http://globocan.iarc.fr/Default.aspx (2018). Accessed 25 Jan 2019.